Since my days at Dallas Seminary I have found I am reading a number of books and or magazines at the same time, a few chapters from this book, then a few from another. I have started to read a series of magazines that was published by Christianity Today call Christian History Magazine. This article about Bible Translation I found most interesting and wanted to share with you. Some of the statistics are out of date as the article was published in 1983. I have updated some of the numbers to be current. It does not take away though the message of the article. I am grateful that I am of part of what is happening in Bible Translation in the world. The 14th Century English translation of the Bible which John Wycliffe inspired and organized was limited in its outreach. And although his translation did not achieve a reformation in England unaided, it did prepare many for the movement when it came a century later. With the invention of printing around 1450 A.D., limited and costly handwritten manuscript copies of the Bible, as in Wycliffe’s day, were replaced with large editions of relatively inexpensive Scriptures. The Church could no longer contain the “heresies” of the Reformers. By 1500 A.D., printed texts of the Latin Vulgate Bible appeared, followed by printed translations of the Bible in German, Italian, Catalan and Czech. The Word in the people’s tongue was spreading. Following the Renaissance, the publication of the entire Old Testament in Hebrew in 1487 and Erasmus’ edition of the Greek New Testament in 1516, the Reformation translations of Luther in German in 1522 and Tyndall in English in 1526 were based on the original languages rather than the Latin Vulgate version of the Church. Luther’s translation became the model for translations by his followers into Danish, Swedish, Icelandic and Finnish. Tyndale’s translation began an era of intense translation and Bible publication that changed the course of English history. One version, the Geneva Bible, went through 200 editions, with one or more editions every year for 56 consecutive years. The King James version in 1611 denominated the field for two and a half centuries and was the basis for the English Revised, the American Standard, and the Revised Standard Versions. Between 1611 and 1946 over 500 different translations of at least one book of the Bible have been published in English. The enthusiasm for Bible translation started by the Reformation was confined largely to the languages of Europe. Of the 34 languages receiving translations in the next 275 years, three quarters of them were European. This, in spite of continued opposition from the Church. Luther was excommunicated, Tyndall forced to flee to the continent. The French, Spanish, and Portuguese Bibles had to be produced outside their home countries. The Reformation failed to provide the missionary vision for translation into non-European languages. The Protestant churches were looking inward and settled down to enjoy the Word in their own languages. The majority believed that the Great Commission was for the First Century apostles only. The era of exploration and colonialism during the 15th to 17th centuries was primarily an expansion of Roman Europe. The Catholic monastic orders, especially the Jesuits, were the missionizing force of the Church. Scripture use was limited to the clergy and in Latin. Translations of liturgical selections, such as the Lord’s Prayer, were made in some languages, but no translation of portions of Scripture is listed for Catholics before 1800 A.D.
Beginning in the 17th Century, Protestant European countries became involved in overseas expansion. 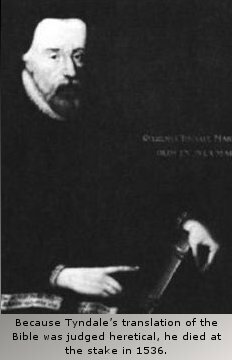 The first translation of Scripture in a non-European language for the purpose of evangelism was Matthew’s Gospel in Malay, done by a director of the Dutch East Indies Company in 1629. The first entire Bible in a new language for missionary use was the work of John Eliot of England in the Massachusetts language of America in 1663. Ziegenbalg, a Danish missionary, translated the first Testament in a language of India in 1717. But the Protestant emphasis in Scripture for the laity in their own language did not develop into aggressive pioneer translation into other languages until the believers of Europe awakened to their worldwide missionary responsibility. William Carey, deeply moved by reading reports of Count Zinzendorf and the Moravian missionaries, followed their example and went to India. 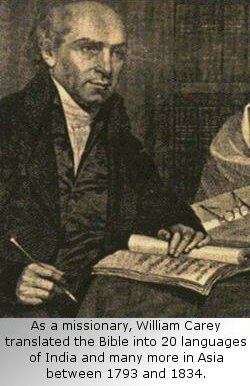 Carey believed the translation of the Bible was the most effective way to advance Christianity and demonstrated it from 1793 to 1834 in India. He personally translated or helped translate Scripture in over 20 languages of India, and with his colleagues translated and printed Scripture in 45 languages and dialects in Asia, in 35 of these for the first time. Carey’s “Enquiry Into the Obligation of Christians To Use Means for the Conversion of the Heathen” resulted in the formation by 1824 of twelve missionary societies in Europe and America. Beginning in 1804, Bible societies were formed in sending countries, for the translation, publication and distribution of the Scriptures. Bible translation soon was worldwide. 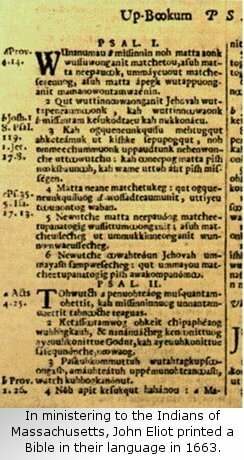 Luke’s Gospel in Tahitian, 1818, was the first Scripture in a language of Oceania. Copies sold for three gallons of coconut oil in Tahiti. Two translations of the whole Bible in Chinese appeared in consecutive years, 1822 and 1823, by Marshman in India and Morrison and Milnes in China respectively. An Aymara professor, encouraged by the British and Foreign Bible Society agent, James Thomson, translated the first published Gospel of Luke in an indigenous language of Latin America in 1829. The Malagasy Bible was completed in 1835 by the London Missionary Society before they fled for their lives. In the following 25 years without missionaries present in Malagasy, that translation resulted in a growth from handfuls to thousands of believers in thriving churches. The Yoruba Bible, 1884, was the first Bible in an African language, done by local Christians aided by missionaries, under the leadership of Bishop Samuel Crowther, the first African bishop of the Church of England. In summary: Before 1800 A.D. only 67 languages had any published translation of Scripture, and only 40 languages had the whole Bible. Between 1800 and 1830, 86 more languages received Scripture for the first time, more than during all 18 centuries preceding. Sixty-six of these were languages outside Europe. What had begun continued to accelerate: Some 456 languages received Scripture for the first time in the 100 years of the 19th Century; 520 more in the first 50 years of the 20th, and almost 600 more in the 25 years ending 1975. By 1982, the entire Bible had been published in 279 languages, the New Testament in 551 more, and at least one book of the Bible in 933, all since the invention of printing. Certain contrasts may highlight historical trends. Beginning with Wycliffe’s translation into English and until about the year 1800, the majority of translations were made for long-established churches of Europe, by educated believers translating from foreign language into their own mother-tongue, in order to combat error and corruption in existing churches, and as part of a movement to gain independence from foreign ecclesiastical control. After 1800 the majority of translations were made for newly-formed churches outside of Europe, by missionaries translating into a language they had learned, for evangelism and training of both leaders and laity, and with a view to the churches handling their own affairs and carrying on their own ministries. First-time translation continues with one or more books of the Bible appearing in a new language every two weeks. Some are for pioneer evangelism, others for missionary churches still without the Bible in the language of the people. Bible translation often brings renewal to such churches and a new sense of independence. Navajo Christians, for example, found they could run their own churches without the missionary, once they had the Word in Navajo. The indigenous church movement, strongly reinforced by political independence of former colonies, has resulted in increased demand for Scriptures in the indigenous language. Who are the people involved in the modern Bible translation movement? There is a growing number of experienced consultants, trained people who can explain the Biblical text and evaluate the quality of a translation in another language, available to help the translators. The bulk of those translating are committed Christians, from all walks of life, who believe supremely in the importance of giving the Scriptures to people in their own language, and have taken training in the Bible, in language learning and analysis, and in principles of translation. The 574 translation projects listed by the United Bible Societies in 1982 involved members of around 200 different denominations and missions. Living Bibles International is currently producing popular-language translations in 110 languages. Mother-tongue speakers of the language into which translation is being made are indispensable to all aspects of translation. In fact, in recent years, a high percentage of translations are being done by national believers. Thousands of missionaries, translators and consultants, serving under scores of other organizations have had this specialized training for pioneer translation and literacy work in previously unwritten languages. Where traditional missions have not always been structured to give translation a proper emphasis, special Bible translation organizations have now begun within four different denominational constituencies in America. Christians in Nigeria, Ghana, Brazil, Philippines, Cameroun, Kenya, Korea and Papua New Guinea have started national Bible translating organizations. The Roman Catholic Church has changed in its attitude toward the use of vernacular languages, reading of Scripture by the laity, and the translation of the Bible, especially since Vatican II. Of the 574 projects listed by the United Bible Societies in 1982, Roman Catholics were actively involved in 133 either as translators or as reviewers. Books summarizing insights from linguistic research and information theory, special exegetical helps, commentary compilations, a quarterly journal for translators, and computerized Greek lexicons and grammatical analyses are available. Computer and word processing equipment for manuscript preparation, typesetting and proofreading are becoming routine. Publication and distribution channels are multiplying, including translations on cassettes. Increasing demand for Scriptures in major languages limits the percentage of the United Bible Society budget available for pioneer translations in minority languages. Other publishers now underwrite a major part of first-time publication costs. The World Home Bible League and the New York International Bible Society, for example, have now financed pioneer translations in 364 languages. The 20th Century is seeing unprecedented translation, publication, and distribution of the Bible. The ultimate goal of the Bible translation movement is that every person, however humble, should have access if not to read, at least to hear read, the Word of God given by the Holy Spirit to the Church in the Old and New Testament texts. Optimally this should be in the language each individual understands best. Methods to speed up adaptation or translation for related languages are being developed. Computers, for example. From a good translation in one language an intelligible rough draft in another related language produced by computer can help a trained speaker of the second language produce a faithful yet readable translation sooner. Recently speakers of three different but related languages in Nigeria, working with an expatriate translation-consultant team, produced simultaneously New Testaments in the Izi, Eza, and Ikwo languages. A similar procedure is now being tried out in a family of languages in Guatemala. Languages without the Scriptures should not be overlooked in areas closed to missionaries. History, Eric Fenn notes, shows us that in countries like India, China, Burma, Korea, Japan and Tibet translation of Scriptures “preceded the opening of the country to organized missionary work.” The scriptures have their own independent witness. People have come to faith through reading Scripture. Churches have been started without missionaries, but with Scripture. The authors of Church Growth in Latin America tell of churches and congregations being established solely through the testimony of a Bible reader who had shared with others the reality of his discovery. “The pattern was clear: First a Bible, then a convert, then a church.” But if the Bible is never translated, it will never be distributed. Mission strategists are emphasizing the need to plant churches in each people group, working with the church until it has adequate members and resources to evangelize the non-Christians within its own group without outside assistance. The one and only, all-purpose resource provided by God to make this possible is the Bible. Bible translation needs should be a consideration in every cross-cultural church planting program. There is no substitute for Scripture in the language of the people. Surely John Wycliffe would applaud such a resolve! Christian History Magazine-Issue 3: John Wycliffe: Bible Translator. Worcester, PA: Christian History Institute, 1983.